We publish our Bulletin four times a year in March, June, September and December. Copies are distributed to financial members, our sister organisations in other states, public libraries, and selected school libraries. The Bulletin is usually about 24 pages, including a four-page insert of Outings. Contributions in the form of letters and articles are always welcome. The NPA Bulletin is produced as a service to members of the NPA of the ACT, and is funded from members’ annual subscriptions. Sufficient copies are printed to meet these needs, and, unlike other NPA publications, copies are not available for sale to the public. 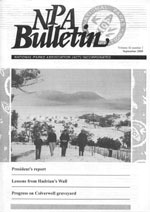 While this also applies to NPA’s special Fiftieth Anniversary Edition of the Bulletin, a small number of extra copies were printed to meet requests from some members for copies for family members, and for the Association’s archives. Due to the increased size and colour format of this special edition, the costs associated with its production are higher than for normal editions. The printing cost alone worked out at $11.00 per copy. Very limited numbers are available.